Date night is a weekly staple in my life with hubby. It's a great way to break away from everything - including computers and television - and just focus on cold beer, good food, and each other. What girl doesn't like to receive chocolates on a date? Well, this girl for one. I like chocolate but I don't love it and I could definitely live without it. So, when I saw the new beer on tap at Porky's (our date night hotspot) I was less than enthusiastic - Shock Top Chocolate Wheat. 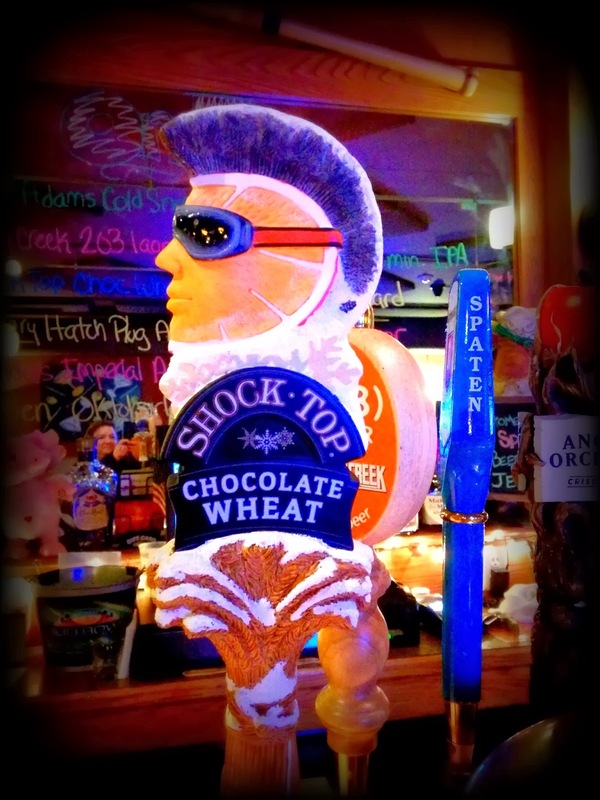 I haven't been a huge fan of Shock Top since they sold out to Anheuser-Busch and, frankly, chocolate wheat beer sounds yucky. But, being an intrepid beer enthusiast, I had to at least give it a try. It was hard going into the whole thing with an open mind, but I did my darnedest. I was not, however, brave enough to go for a full pint. So, I asked for a sample. Chocolate Wheat was dark brown with a thin skim of foam on top. It smelled like chocolate, it tasted like chocolate. But not much else. It certainly didn't taste like beer and no trace of wheat. It was very much like a thin chocolate soda. Not much going on here but chocolate. Which is great, I guess, if you like chocolate.